The experience of many students studying public international law at university is, 'This is fascinating, but what can I do with it?' While this Guide in no way detracts from the more intangible reasons to study international law, it is practically focused and explores the options available to law graduates beyond traditional or domestic law career paths. The range of possible careers is vast - from human rights to investment law and from the courtroom or boardroom to the refugee camp - and the Guide offers a step-by-step approach to considering whether and how to pursue a career in one of these areas. The essential message is that international law jobs are out there and attainable if approached strategically and with perseverance. In this second edition, the text - written as a series of questions and answers - is supplemented by a broader range of practitioners' views and experiences, as well as updated appendices containing concrete information on the most useful internships, short courses and Master's programmes. The e-book version of this volume is now available for purchase at ISBS. Please note that we cannot offer member discounts on e-book purchases. 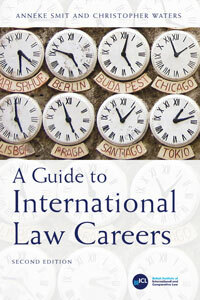 "A Guide to International Law Careers Volume II"